If you'll notice the distance between the planet and the yellow dwarf, it's only about 1.6 AU, so despite its status as a tidally-locked planet, its actual brightest side should not be utterly frozen. It may not be quite that simple, though. The frozen side of the planet only gets sunlight from the yellow star during half of the planet's orbit around the red star, during the other half of its orbit the frozen side faces away from both of the stars. So the net insolation of the frozen side would still be lower than the non-frozen side, averaged over time. One of the things I recall seeing on the "to do" list is seasonal ice cap changes, I hope whatever system gets used will be able to handle situations like this. Planets with 90-degree tilts have similar "hot pole/cold pole" reversals, too. 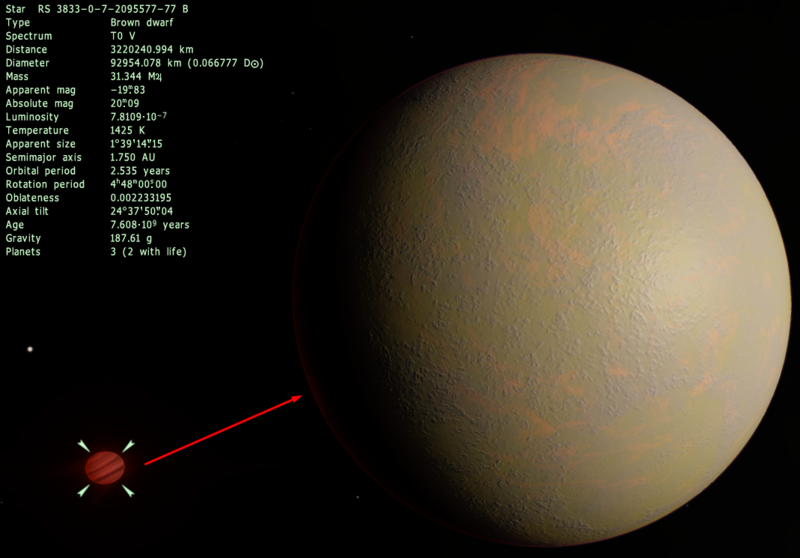 Well, 1.6 AU is pretty far, similar to Mars' distance to the Sun. The yellow star is also only a G8V. It might only give the planet similar amounts of heat as the asteroid belt gets, and it's quite cold there. 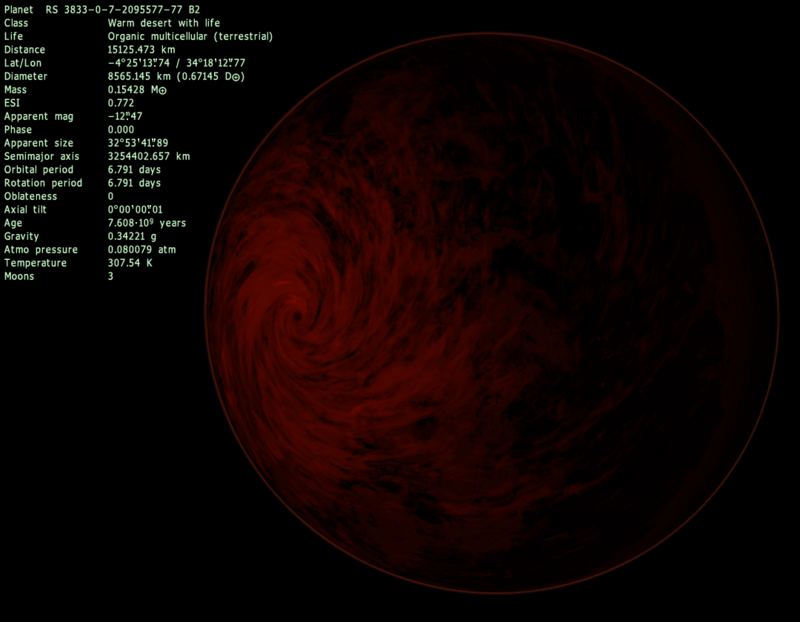 Still, the placement of night side icecaps in binary systems could be improved. Actually, it's been studied that in the case when there are at least two sources of heat in the solar system, the pattern of clouds might be pretty complex. Yeah, same was in the previous versions, but it is possible that we only need to have 1 particular model of atmosphere for that case. One of the other ideas might be that, actually, the side that always facing the red dwarf is never frozen and always receives heat in great amount, because it has no snow, and the other side is covered with eternal glacier, so the light always bounces off the surface during the day and cools down during the night. Thus, only a small part of the planet gets a significant heat difference during the day, the part near the border of ice cap. 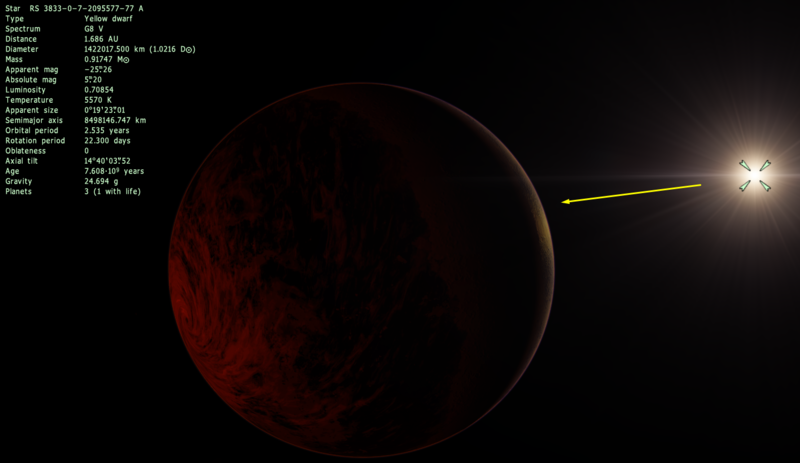 Well, 1.6 AU is pretty far, similar to Mars' distance to the Sun. The yellow star is also only a G8V. It might only give the planet similar amounts of heat as the asteroid belt gets, and it's quite cold there. It would also be getting heat from the brown dwarf, though, which is distributed between the near and far sides by the atmosphere. I recall reading an interesting article a while back about the projected heat distribution between the day and night sides of tide-locked planets and it's quite complex. If there isn't enough heat transfer the planet will suffer "atmospheric collapse" when the temperature at the far pole drops below the freezing point of the primary greenhouse gas of the atmosphere (usually carbon dioxide). The atmosphere starts snowing out, which makes it thinner and reduces its greenhouse effect, which makes the far pole even colder, in a feedback loop that eventually leaves the planet airless. If the planet doesn't have enough water for an ice cap that reaches out of the cold trap, or an ocean to circulate heat from the near pole to the far pole, it can also lose its liquid water in a similar manner.